SALEM - If you’ve been lazily enjoying the dog days of summer when behind the wheel, well, perk up and pay attention: school’s getting back in session all across Oregon. Children are zipping around on bikes or skateboards, making their way to school on foot, hopping excitedly in and out of cars… and not necessarily paying attention – so it’s time for you, driver, to get back in the swing of safety around schools. NOTE: “when children are present” is defined as when children are occupying or waiting to cross in the crosswalk or when there is a traffic patrol member at the crosswalk. “When children are present” applies only at a crosswalk away from the school grounds and applies at any time and on any day. Read on for more tips. Watch for children walking, biking, scooting or skateboarding to school in the morning and from school in the afternoon. They may be inattentive and excited, or they may be learning a new route, so be prepared and on the lookout. Remember speeds around school zones: 20 mph is the maximum in most cases. Slow speed = less distance to stop. Stop and stay stopped for people in crosswalks (and keep an eye out for those who cross streets at other spots). Be alert for school buses: when overhead lights flash yellow, prepare to stop. When they flash red, stop. Children may be crossing the street in front of the bus! Obey school crossing guards, whose job it is to help students safely cross the street. Avoid distractions. It is illegal to use a handheld mobile device while driving in Oregon, and you may be subject to criminal penalties. Follow school parking lot circulation plans; these help provide safety for pedestrians and bicyclists. Walk with an adult, responsible older sibling or in a group. Walk on the sidewalk, if there is one, or walk facing traffic; be extra careful around driveways or when passing through work zones. Walk focused and alert, not using electronic devices. Cross in a crosswalk and/or with the assistance of a crossing guard. Cross with the signal, not against it, and only cross if all approaching cars have stopped. Wear bright colors and reflective gear, especially as days get shorter. Follow all rules of the road: ride in the same direction as traffic, stop at all stop signs and signals, etc. Communicate with drivers by using hand signals to indicate turns and stops. Choose safe routes to schools, such as streets or trails with lower traffic volumes and speeds. Ride focused and alert, and don’t use of electronic devices while riding. You can get back in the swing of school safety by being rested and putting away all distractions – including your phone. 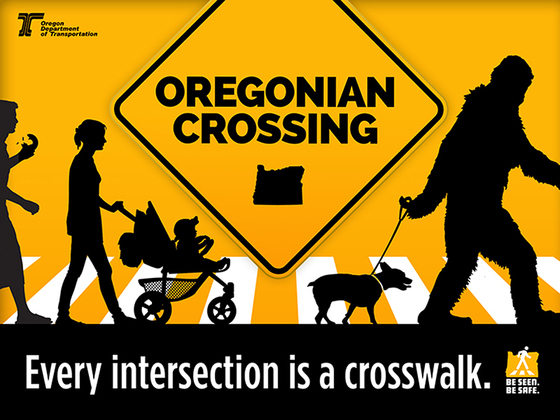 ODOT’s Transportation Safety Division offers a variety of posters, brochures and other items you can order or download and print, including the popular Oregonian Crossing material, featuring Bigfoot and the reminder that “all intersections are crosswalks” (whether marked or not). In addition, Safety is running a social media campaign that encourages everyone to "Say what you see." ODOT’s Traffic Roadway Section has a complete Guide to School Area Safety (PDF) with an overview of laws regarding crosswalks and school zones, information about school safety in rural areas and more.